Pardon the dust while construction begins. Don't worry, we'll keep the ice cream covered. 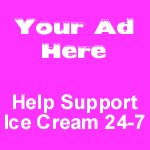 IceCream24-7.com is the webs newest portal for the ice cream and frozen dessert retail industry. Primarily for mobile vendors, parlors and concession stands retailing novelty, soft serve and dipped ice cream, sorbets, Italian ices, shaved ices and gelato. We will be adding features as we build the site. Foremost there will be a vendors directory, where you will be able to list your business and the services you offer. This way the consumer looking to hire an ice cream vendor for a birthday party or event can contact you. The site will also feature a history of ice cream of all types and if anyone has anything to offer, please contact us. The first feature of IceCream24-7.com is our vendors message board. We hope that it will be the internet's most popular forum for swapping ideas and networking with your peers. Please sign up and participate on our forum. We will monitor and moderate the board to insure that it meets everyones expectations for a professional portal. This website is a work in progress and thanks for being patient during construction. Starting a restaurant? Click here for affordable restaurant business plans and financials.